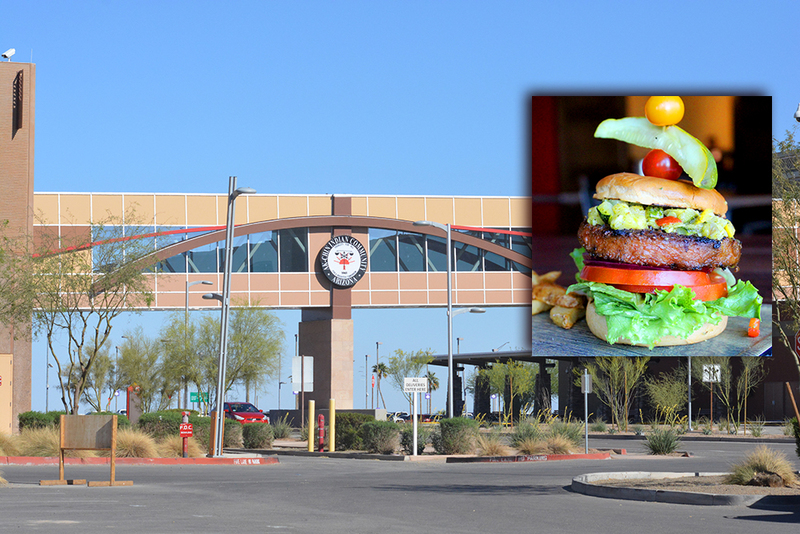 Home Tags Articles tagged with "Edison Pointe"
The last four months of 2018 saw five businesses receive commercial permits in Maricopa at a total value of over $3 million. IHOP completed its construction, and Dutch Bros. are ready to begin, and the following three are in the throes of construction. 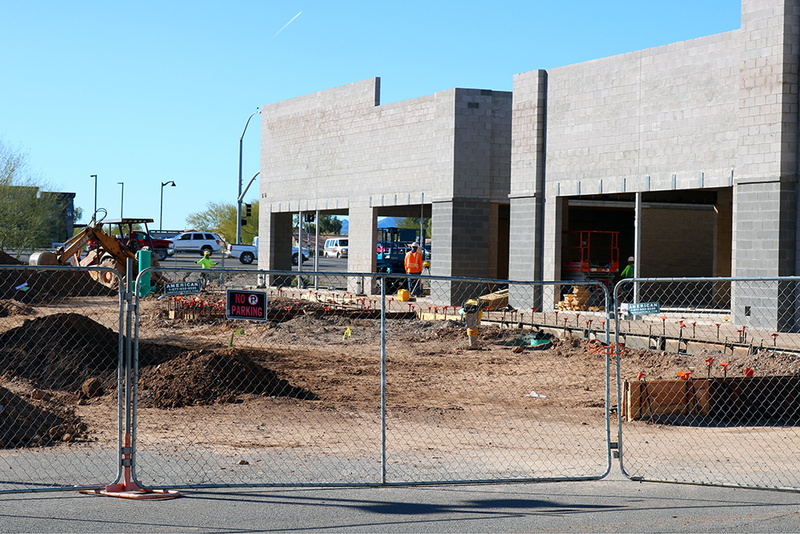 Work is moving quickly at the future Circle K convenience store at 41433 W. Honeycutt Road. The property includes seven fueling stations to serve up to 14 vehicles. The store is to be 5,881 square feet. It received its commercial building permit in October and is being constructed by Alexander Building Company. 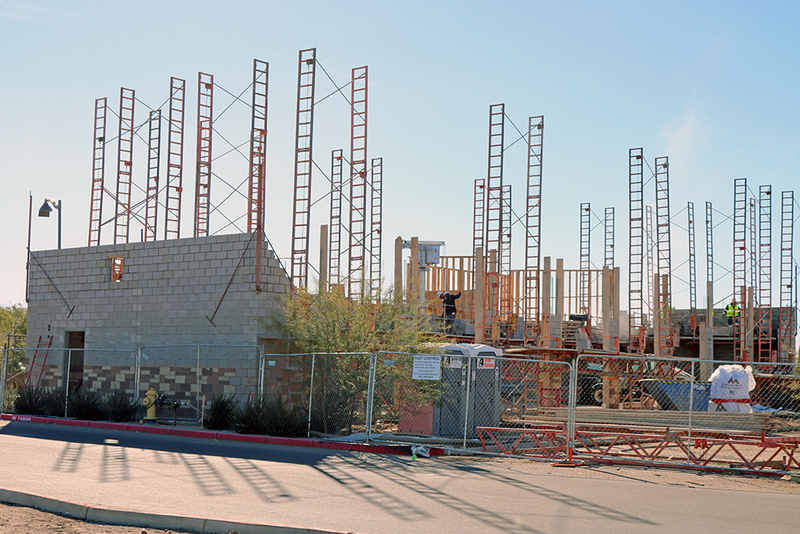 Brakes Plus is building at 44510 W. Edison Road in the Edison Pointe Complex. Sitting on a little more than half an acre next to IHOP, the building is approximately 4,886 square feet. DG Fenn is in charge of the construction. Directly across the street from Brakes Plus, Signal Healthcare’s future medical offices at 44565 W. Edison Road are also progressing steadily in Edison Place. The project, which is 9,000 square feet, is two buildings connected by a breezeway. The construction is west of Big O Tires. 5. 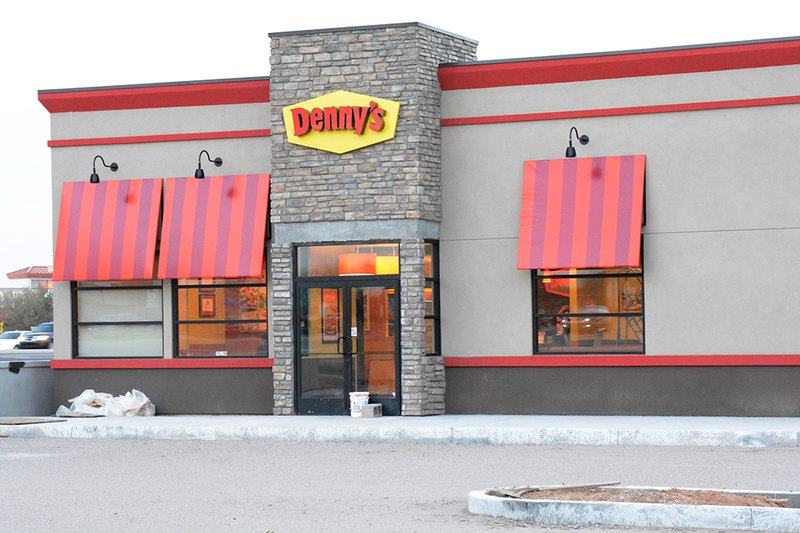 Denny’s Restaurant caused much curiosity during its construction on a seemingly small lot and then more enthusiasm when it started hiring. 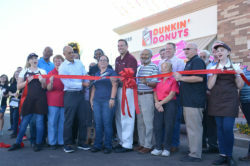 It finally opened its doors in February near the southeast corner of John Wayne Parkway and Smith-Enke Road. 4. Those involved weren’t happy about the situation, but readers were amused when the new Dollar Tree opened in May and then immediately had to close for a couple of hours as city inspectors did their job. 3. With the many businesses opening, there were also some closures. That included Zoyo Yogurt in Maricopa Station. 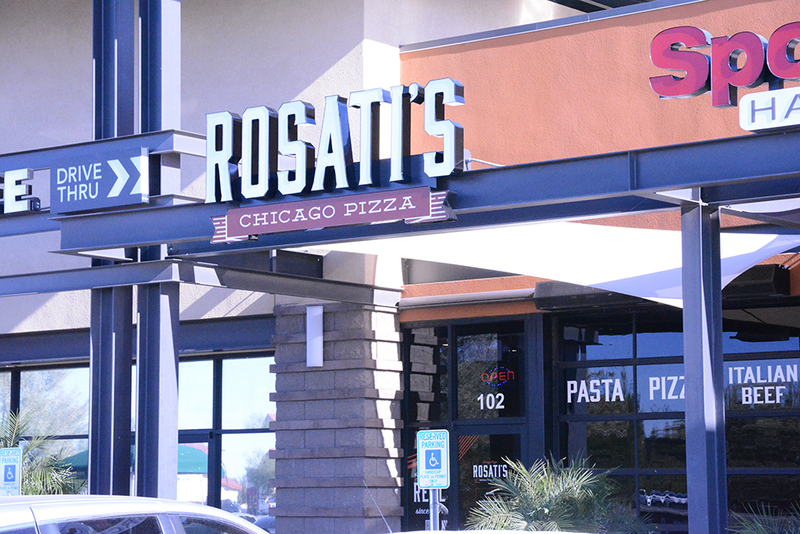 However, readers were happy to see Rosati’s Pizza immediately announce its intention to take over the spot. It opened in December. 2. Harrah’s Ak-Chin Casino was majorly transformed in 2018 in its continuing expansion. It added a skybridge to UltraStar Multi-tainment Center, opened the restaurant Chop Block & Brew and opened a spa. It is also adding ballroom space and 200 hotel rooms. 1. Hands down, the most reader interest garnered by an economic development story was the series of business openings in Edison Pointe, developed by Vintage Partners. 2019 sees the openings of IHOP and BrakesPlus there as well. IHOP is asking for variances from the city code. After the developer hinted months ago about a breakfast-oriented restaurant being interested in Edison Pointe, a major player is making early steps to build. On behalf of IHOP (International House of Pancakes), the Romulus Restaurant Group has applied for a variance at the location at 20595 N. John Wayne Parkway. Aug. 22, the city’s Board of Adjustment will host a public hearing for comments on the requests. The company is seeking a reduction in the maximum setback requirement and a variance of the code requirement of transparent windows. The board is then set to take action on the requests. The meeting starts at 4 p.m. in council chambers at City Hall. 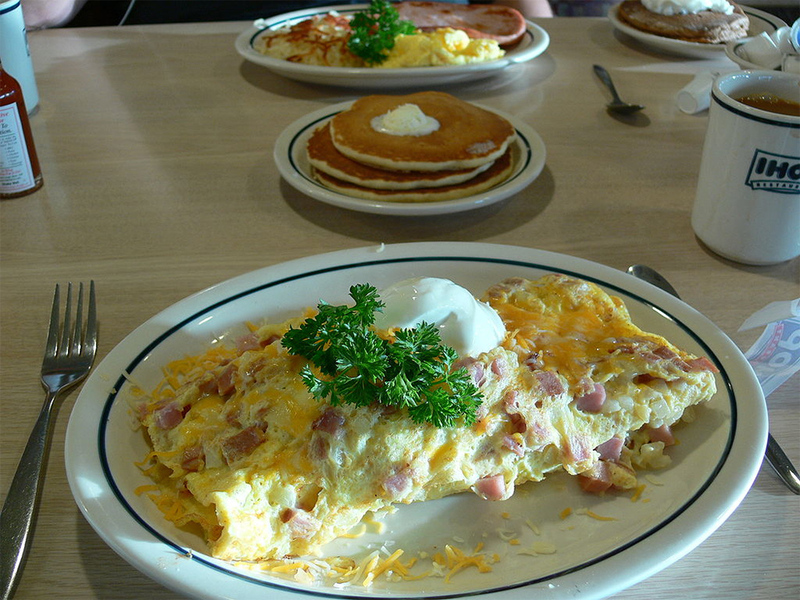 The IHOP chain is celebrating its 60th year in business, founded in July 1958 in California. It now has 1,650 locations. It is a subsidiary of DineEquity. 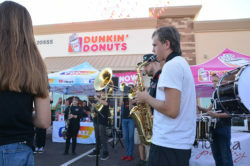 While its neighbors work on getting store-ready, Dunkin’ Donuts opened in the Edison Pointe shopping plaza Friday morning with great fanfare. 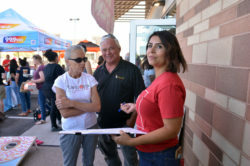 Owner Alex Apodaca, who owns several stores, said he and his partners usually do not go “all out” for an opening in larger cities because the interest isn’t as keen as it is in a smaller suburb like Maricopa. 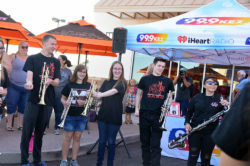 This time, “all out” meant band members from Maricopa High School, a radio remote, kids games and more, with activities continuing Saturday with a pinstriping demonstration. The official ribbon-cutting including Mayor Christian Price, city council members, Chamber of Commerce members and candidates running for assorted offices. Some proceeds from the grand opening weekend benefit three nonprofits. WingStop is meant to go in two doors down and still has a lot of work to do. A city stop-work order was posted on the door of the store space in between, which is to be a nail salon. Meanwhile, work continues steadily nearby on the new Burger King, which is expected to open this summer. In the anchor space in the plaza’s main building, Ross still has a projected open date of July 21. 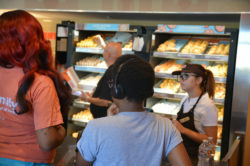 Dunkin’ Donuts is planning its grand opening Friday morning. The store will open at 4 a.m., but the ribbon-cutting with Mayor Christian Price, the city council and Maricopa Chamber of Commerce is scheduled for 7:30 a.m. 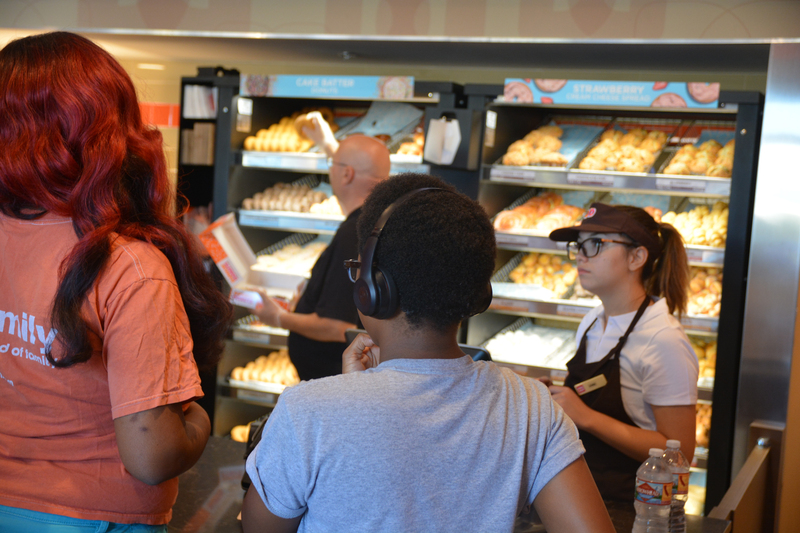 It will be the first Dunkin’ Donuts in the city. 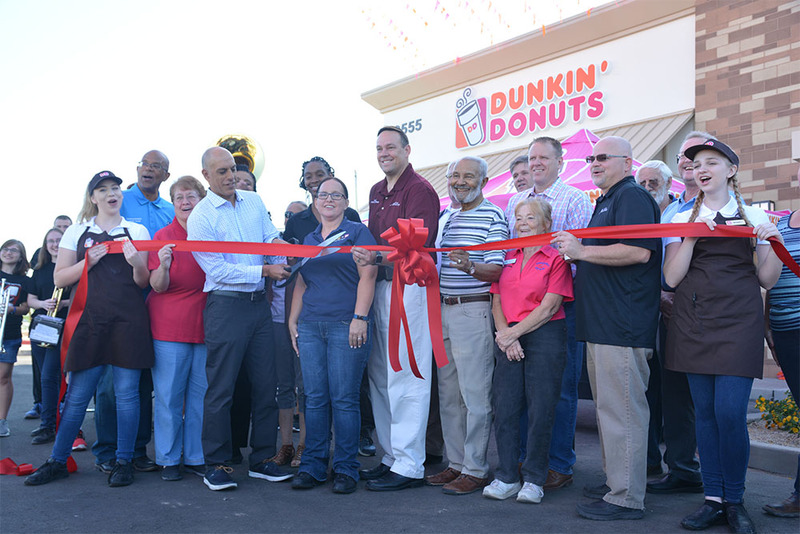 Owner Alex Apodaca said he’s celebrating his 10th year of owning Dunkin’ stores in the Valley. He’s part of a group of partners that own 39, with 13 in Las Vegas, Nevada, and seven more in Colorado Springs, Colorado. 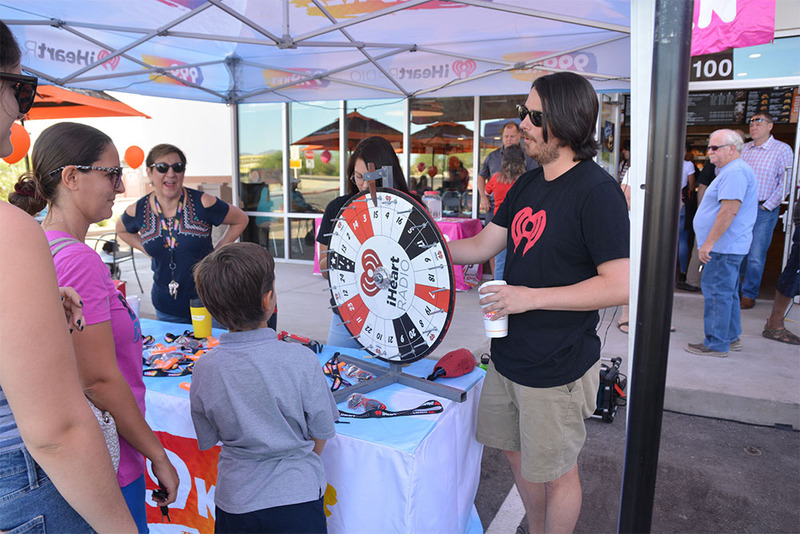 Friday, from 7 to 10 a.m., there will be a variety of activities, and the weekend will also include a live remote with radio station KESZ. Fifty percent of the proceeds will go to F.O.R. Maricopa Food Bank and two other Phoenix-based charities, Changing Lives Center for Women & Children and a teen suicide prevention organization. There will also be face-painting, mascots and a bike-pinstriping demo. 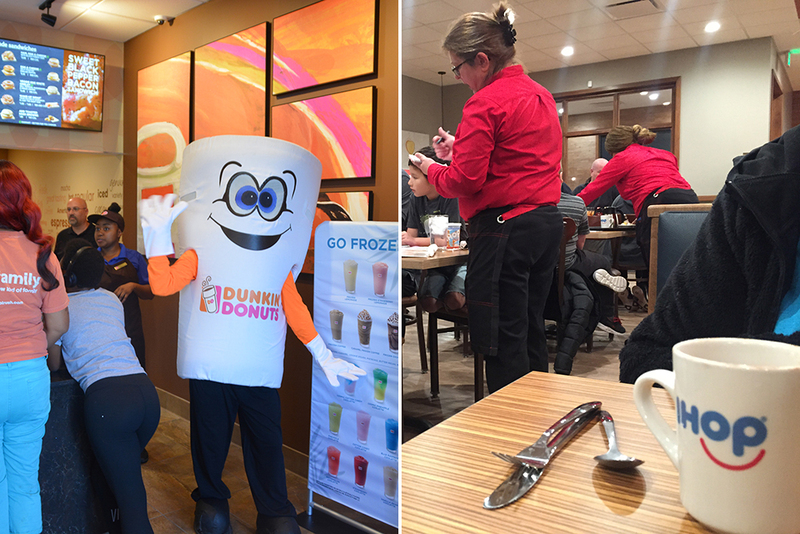 Rather than selling a franchise at a time, Dunkin’ sells territories, which is how Apodaca and his partners spread so quickly. It came about, he said, when a friend called him a decade ago in California with an idea. “He said, ‘I think I found a concept to drag you out of San Diego,’” Apodaca said. Apodaca said the partnership had been trying for years to come to Maricopa, struggling to find the right real estate. They wanted the property to be on “the morning side of the road” and in an area that was the middle of activity. The Maricopa store is in the Edison Pointe shopping center on the east side of John Wayne Parkway. Edison Pointe has some stores open and others still under construction. Along with 1,800 square feet of store space it is a drive-thru. Apodaca said 95 percent of his stores have a drive-thru. He said the store will have baking on site and will also have product brought in from the Valley when necessary volume dictates. Apodaca said Maricopa is one of those “outlying” cities like Flagstaff that he and his partners enjoy so much. In the culture and in the community, it feels like family. “They are so receptive to what we’re doing,” he said. The last item going up for the Dunkin’ Donuts store is usually the first thing – its signage. The store currently has a banner but not its permanent sign. Apodaca said he hopes it is in place by the grand opening. Other businesses soon to open in the same stand-alone building within the plaza are a nail salon and a Wingstop. The latter received its liquor license this week. Maricopa’s second discount store held its grand opening and ribbon cutting Thursday morning. 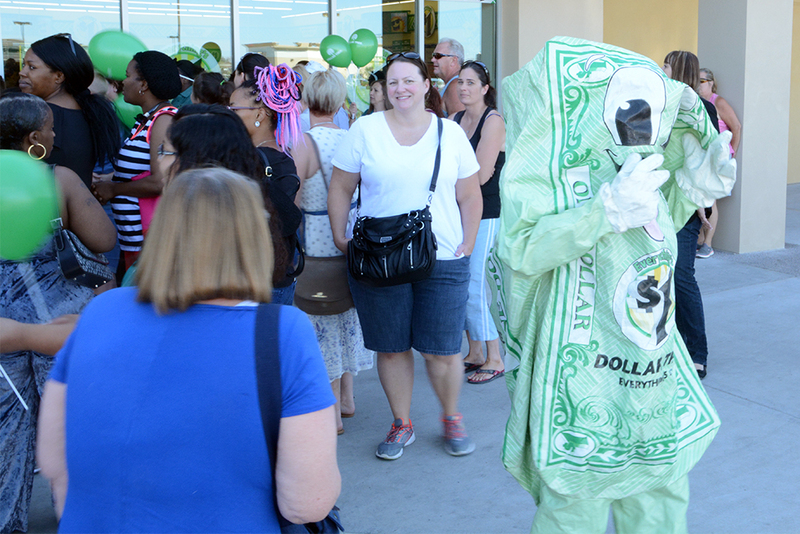 However, Dollar Tree’s newest customers were ushered out of the 10,000-square-foot building soon after doors opened. City building inspectors and the fire marshal temporarily closed Edison Pointe’s latest retail shop for a little more than an hour to perform final inspections. They did not explain the timing. Deputy Fire Marshal Eddie Rodriguez with the Maricopa Fire/Medical Department said Dollar Tree received approval by both agencies. “Everything is OK. They’re opened up again; business is going good as usual,” Rodriguez said. The store is located at 20595 N. John Wayne Parkway south of Fry’s Marketplace. 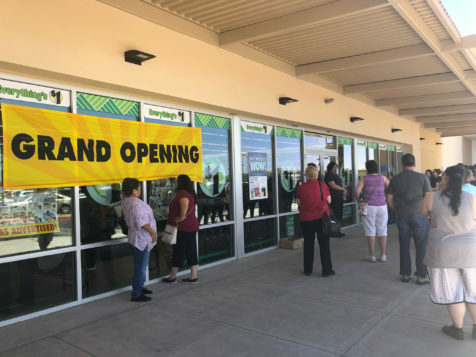 Discount variety store Dollar Tree is planning a May 10 opening of its Maricopa store in the Edison Pointe plaza. The business will employ 12-20 people. Those interested can apply online at DollarTree.com or in person at the store. 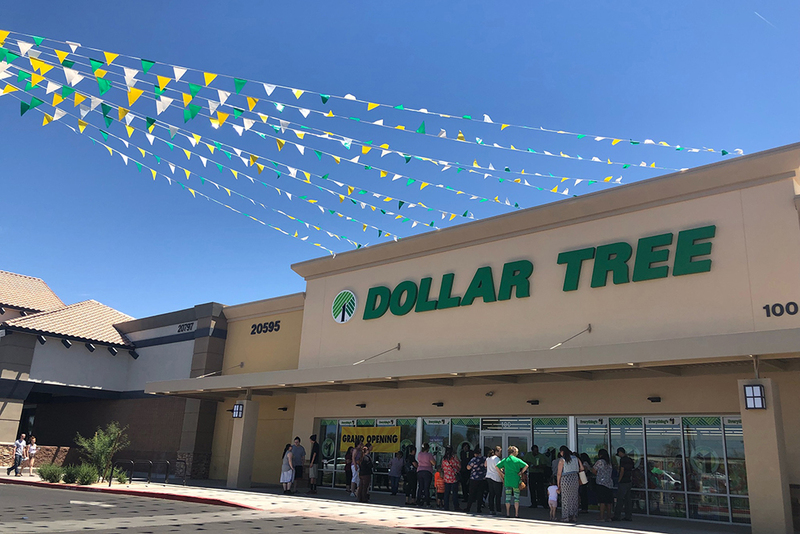 “Dollar Tree is pleased to invite customers to experience our great value and broad assortment of merchandise all priced at $1 or less,” said Dollar Tree spokesperson Kayleigh Painter said in a news release. The store is 10,000 square feet and is located at 20595 N. John Wayne Parkway. 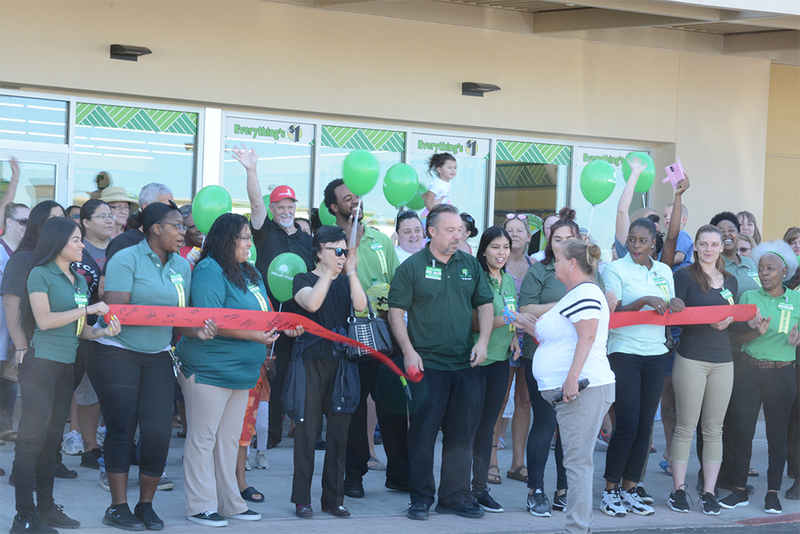 “Dollar Tree continues to grow, and we are proud to be part of the Maricopa community,” Painter said. Dirt is being moved on the lot of a future Burger King at Edison Pointe. 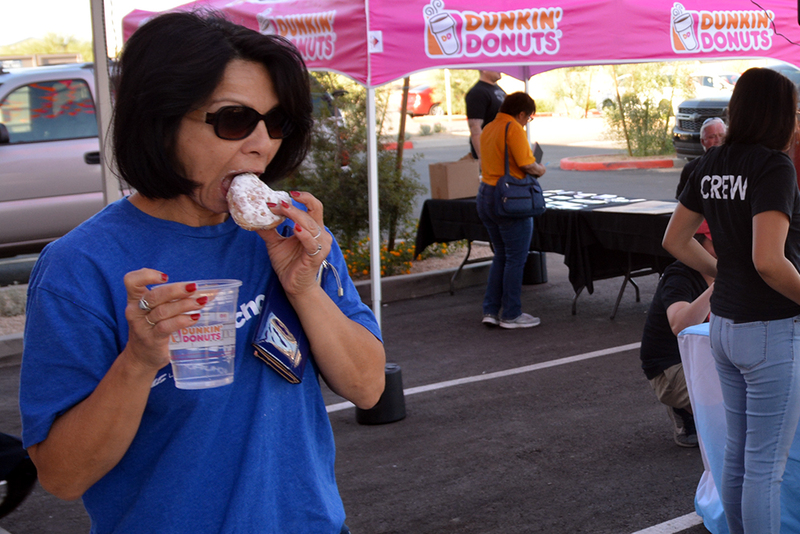 Hundreds of people lined the new sidewalks of Edison Pointe’s first retail grand opening last week as Goodwill opened its doors March 16. The event drew two Maricopa High School students who decided to spend one night of their spring break camping at the used-retail shop’s front doors. Other tenants slated to open this month include Planet Fitness and Ross Dress for Less. Project Manager John Scholl confirmed Monday Dollar Tree is one of Edison Pointe’s newest retail stores. Dunkin Donuts, Wingstop, a nail salon and other tenants could open on the westside of the development in late spring. This summer, Burger King is projected to open by mid-June. A sit-down breakfast restaurant and an auto service center are currently finalizing contracts with Vintage Partners. Those establishments would be constructed on the southside of Edison Pointe. 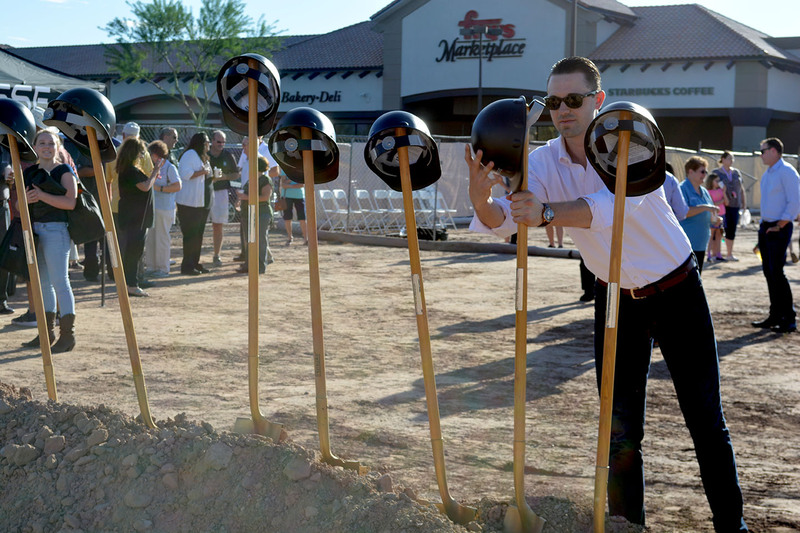 Businesses within the new Edison Pointe shopping plaza are beginning to open this month. The first opening is the Goodwill store, which plans a grand opening March 16 from 9 a.m. to 9 p.m. The thrift store is offering a $5 gift card to the first 150 people in line. They will have coffee and doughnuts. Those who bring a bag of donations during the opening weekend, March 16-18, will receive a $5 coupon. Planet Fitness is already taking memberships and has its grand opening planned for March 27 at 11 a.m. The 24-hour gym is offering pre-grand opening discounts. Ross Dress for Less is also on track to open in late March, but date and time have not been set. Other upcoming businesses include Dunkin Donuts and Wingstop. Construction of a Burger King has not yet begun. The plaza is at 20595 N. John Wayne Parkway on the northeast corner of John Wayne Parkway and Edison Road. Development of Edison Pointe moves forward. The property at 20595 N. John Wayne Parkway, south of Fry’s, will be anchored by Ross Dress for Less. The Goodwill store is set to open first, planning a grand-opening ribbon-cutting March 16. The store sells used clothing, furniture and household goods to provide free skills training and job placement. Planet Fitness currently plans to have its ribbon cutting March 27. The populist gym franchise will be in Suite 400 with a corner entrance and will be open from 10 a.m. to 7 p.m. weekdays before the full opening when it becomes a 24-hour facility. The Maricopa location has web and Facebook pages in the early stages. Other opening dates will be announced later. 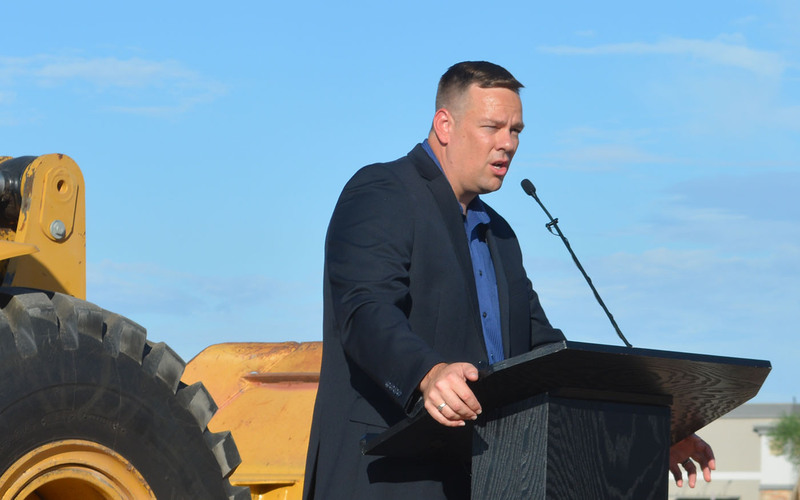 Despite leaving Vintage Partners for Pederson Inc., developer Casey Treadwell continues to lead the Edison Pointe project. Meanwhile, on the far north end of Fry’s Marketplace, Denny’s moved grand opening plans due to permitting and other delays. It had tentatively set a date of Feb. 19. A grand opening has been delayed to Feb. 21 at the earliest, again tentatively. 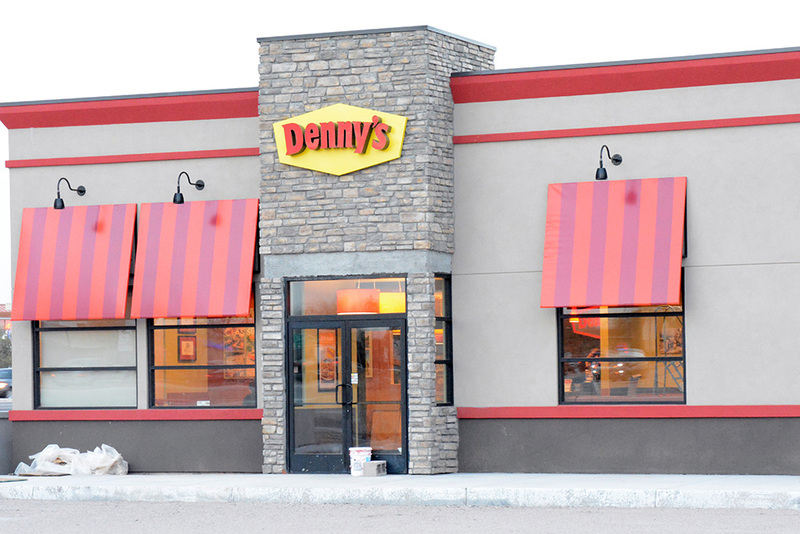 UPDATE: A ribbon-cutting for Denny’s is planned for Monday morning, Feb. 26. Edison Pointe developer Casey Treadwell of Vintage Partners talks to Maricopa Chamber of Commerce about the past, present and future of the lot south of Fry’s Marketplace. Construction is ongoing to accomplish a February opening of several of the businesses, which include Ross and Goodwill. In the video, Treadwell given an overview of the previous plans for the development and how they have changed into the current site plan, plus how retailers have come in and out of the picture as it continues to come together. Work on the new Denny's site is among projects changing the profile of Maricopa. A proposed Denny’s received a commercial permit Sept. 6 as Halabu Development prepares to construct a 4,041-square-foot diner. The property is at 21195 N. John Wayne Parkway, near the southeast corner of the Smith-Enke Road intersection. The project is valued at $532,644. 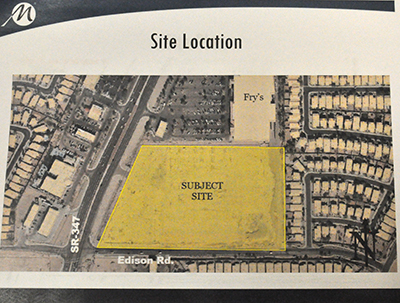 Permits continue to come in for the Edison Pointe development north of Fry’s Marketplace at 20595 N. John Wayne Parkway. Chasse Building Team received a commercial grant Aug. 23 for buildings A, B, C and D on the property for the project valued at $7.5 million. Chasse was also granted a commercial permit Sept. 18 for Pad B of the ongoing construction at Edison Pointe. The Vintage Partners project will house Ross Dress for Less, Goodwill, Brakes Plus, Burger King, Dunkin Donuts and Planet Fitness among others. DRH Construction is converting one sales office into a garage and converting another garage into a sales office. DR Horton had been using the garage space at 40733 W. Sanders Way as its sales office in Homestead North. As that returns to being a garage, the developers will create a sales office out of a garage at 18501 N. Crestview Lane in Glennwilde. A new wireless communication facility is in the pre-application process on property at 19000 N. Porter Road. The project is listed as Coal Creek for T-Mobile. 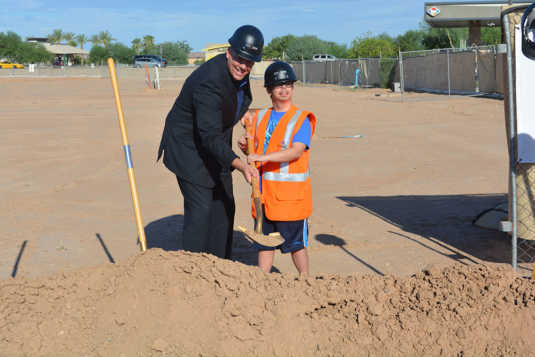 Maricopa Lutheran Church, which currently has its services in Desert Wind Middle School, is in the pre-application stage of building on a parcel on the northwest corner of White and Parker Road and Santi Road (formerly Cowpath). Aug. 31, the property received a permit for a flow test for a fire line and hydrant. Nearby, Our Lady of Grace Catholic Church received a grading and drainage permit on its large property at 40929 Santi Road. The company in charge of the work, Ellison-Mills Contracting, received a delinquent notice on its out-of-town business license. 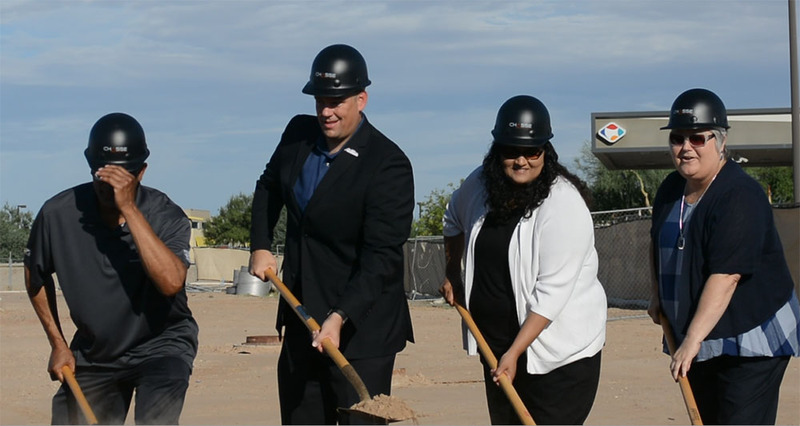 A project 10 years in the making hit another milestone Monday morning with a ceremonial groundbreaking. Edison Pointe, a commercial development south of Fry’s Marketplace, is scheduled to include Ross, Planet Fitness, Brakes Plus, Burger King and Dunkin Donuts. The mayor, councilmembers, Vintage Partners Leasing Director Casey Treadwell and Economic Development Director Denyse Airheart participated in turning earth at the site where areas have already been prepped for foundations. That includes Burger King, which is planned for the northwest corner of the property near Fry’s gas station. Ross and other anchor establishments are expected to open in February and March. With a shared boundary, Vintage Partners has been coordinating with Fry’s during development. “All of these properties are tied together in their agreements, so we had to maintain certain things for Fry’s,” Treadwell said. “In exchange for the help they’ve given us, we’re going to give them a little land so they can add another gas [island] at the end. It’s just a tiny piece. The property was planned for development in 2007 but became a victim of the recession. Vintage took over the project four years ago. Price said Vintage understands the community and what it wants. 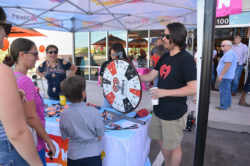 “I’m excited to welcome these new retail amenities to the community because this is what keeps the residents here local and supporting these businesses,” Airheart said. “I’m happy as a former Planning & Zoning commissioner to know that things actually do get done,” Wade said. “When people ask us what cities we like to work with, Maricopa’s at the top of the list,” Treadwell said. A long-awaited commercial retail project could be weeks away from breaking ground, according to both city officials and key players in the project’s development. The plan is to have a major clothing retailer, gym, multiple new restaurants and various other stores that could create 100 jobs or more in Maricopa by spring. The dirt lot south of Fry’s Marketplace has changed hands a few times since the city slated the land for commercial development more than 10 years ago. Now, the area known as Edison Pointe is in the final stages of gestation, according to Casey Treadwell, leasing director at Vintage Partners the development group in charge of the project. Despite losing one of its larger prospects – Petco – Vintage is hoping to commence construction at Edison Pointe by the end of July. The process of development is not an easy one, city Economic Development Director Denyse Airheart said during a Maricopa Advocate Program meeting Thursday. Maricopa being so young and constrained in so many ways, it can be difficult, she said, to attract and solidify new development. To Airheart, Edison Pointe is a milestone of sorts, which means job creation and economic growth. She praised Vintage for its efforts and willingness to take the chance on Maricopa. “These guys [Vintage] have been aggressively trying to find tenants for the site,” Airheart said. There are still a few financial ducks to align before the project begins. However, both Treadwell and Airheart are confident in saying the project will soon be moving forward. An exact date has not been set for groundbreaking. 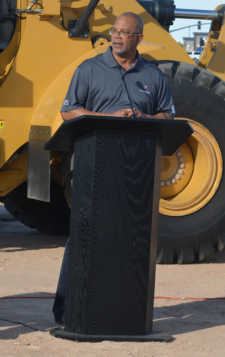 And though Treadwell could not speak to the opening of the individual businesses, he said Maricopans should be able to anticipate the project being completed in spring of 2018. Signed tenants include Ross, Goodwill and Planet Fitness. Businesses in escrow for, or already in ownership of, property at the site include Dunkin Donuts, Brakes Plus and Burger King. Economic Development Director Denyse Airheart is proud of the teamwork that created the Edison Road extension. The Edison Road extension is complete. Edison Pointe is finalizing leases. Commercial development at Copper Sky may also see some stimulation in 2017. Estrella Gin Business Park is still waiting for the light to shine. Public Works Director Bill Fay will give an update on the SR347 Overpass, Economic Development Director Denyse Airheart will let you know the latest information on the Edison Pointe development, and the mayor and councilmembers will be there to answer your questions and listen to your concerns. When: Tuesday, April 11 at 6 p.m.
Who: All residents are invited. Pieces are in motion for construction of an overpass to begin this year. Developers are reviving nearly-forgotten subdivision plans. 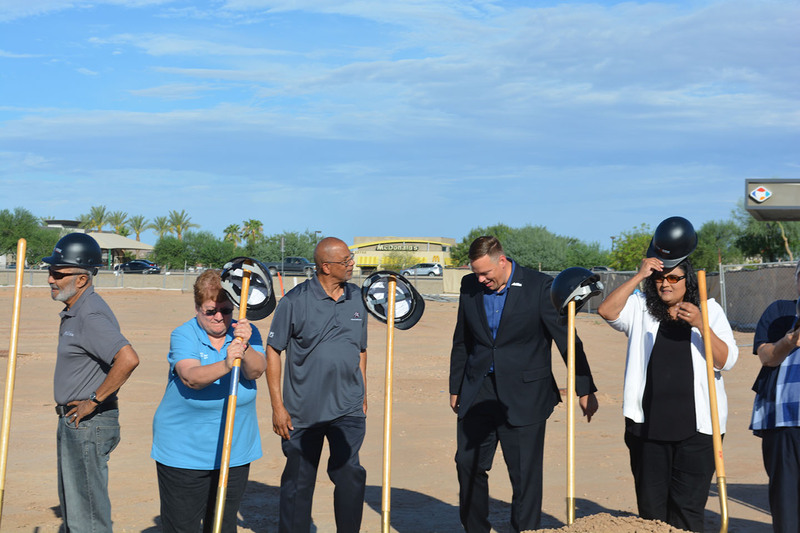 APEX Motor Club and Denny’s have shown plans to build in Maricopa. 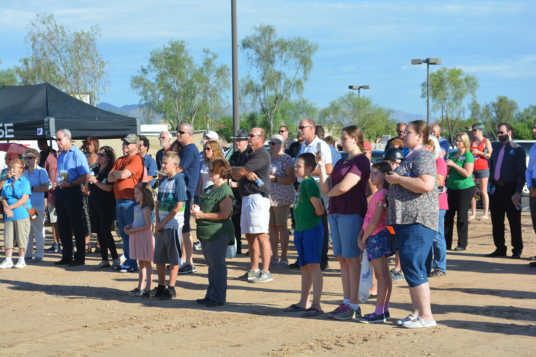 Economic development in Maricopa is showing varying signs of progress this year as the city has studied approaches to growing the economic base of the community. 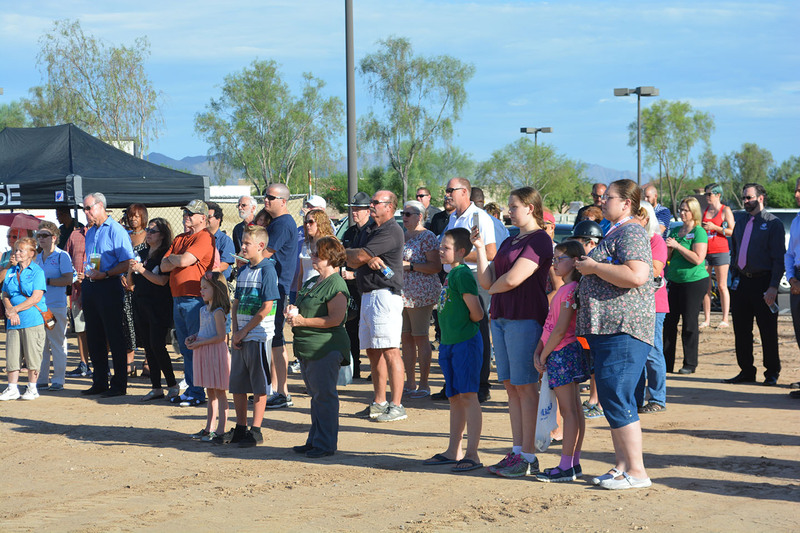 The improving economy has not necessarily created changes to the demographics of Maricopa. Denyse Airheart, the director of the city’s Economic Development Department, does not predict major changes to the methodology when the Economic Development Strategic Plan takes form this year. “We target companies based off the assets of the community,” Airheart said. That includes the youth (the average age of Maricopa residents is 33.8 years), income and education level of the population. Those selling points look much as they did three years ago. A draft of the Economic Development Strategic Plan is scheduled to come before city council in April. Maricopa may broaden its target sectors, Airheart said. Growth of employment opportunities within Pinal County, especially Casa Grande, may also impact the plan. But Maricopa is still selling itself. Nailing down a description of Maricopa for prospective companies and creating a narrative of its future is not just a challenge for City Hall. Retail developers have had similar tests. Edison Pointe, at the northeast corner of John Wayne Parkway and Edison Road, is about a year behind leasing a typical development of its size, according to Vintage Partners leasing director Casey Treadwell. He said it has been difficult educating retailers on the attributes of Maricopa. “I know it’s been frustrating for people wanting to see something going,” he said. At a Maricopa Advocates Program meeting in February, he predicted movement on the ground within a couple of weeks. But a month later, he said Vintage was still putting final leases in place. Businesses he announced as part of the development are Ross, Burger King, Planet Fitness, Dunkin’ Donuts and Petco. Mayor Christian Price has called it a game of enticement. The City itself knows the irritation of owning commercial property that stands empty for years. It has property at Copper Sky intended for commercial development since the park’s inception. An effort to develop the land may soon be renewed. The conceptual plan includes mixed-use commercial, a hotel and a restaurant. 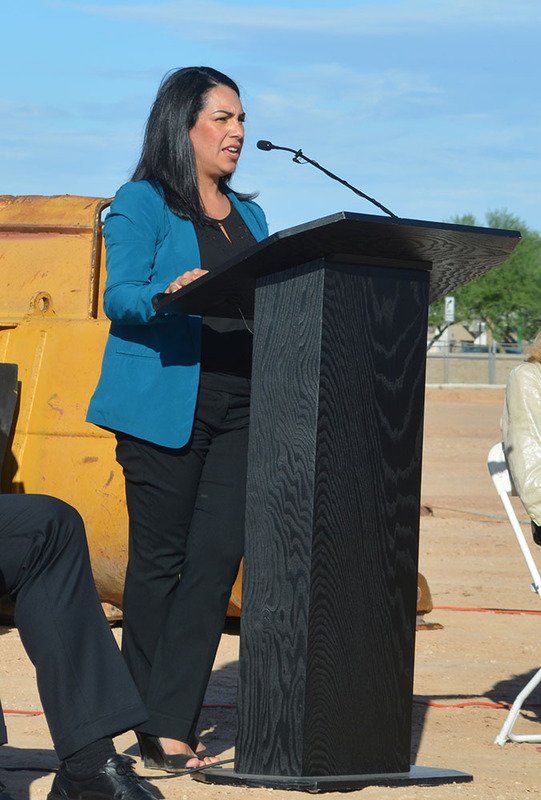 The City of Maricopa also owns commercial property at what is planned as the Estrella Gin Business Park. 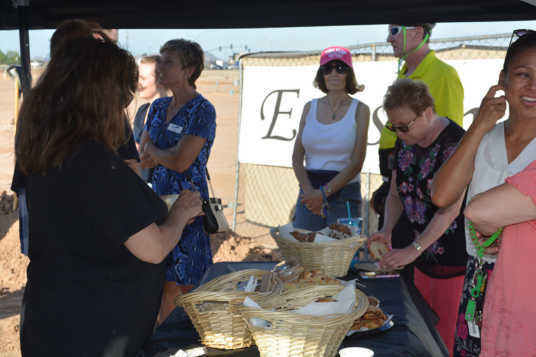 Luring companies to the site has been a struggle, but the six-year effort has produced a new roadway – the Edison Road extension. Airheart calls the new road one of the proudest achievements of her department. “All the partners had to work together to make Edison Road a project,” she said. The road was completed in March and provides another bypass between State Route 238 and John Wayne Parkway. Using a federal grant, the city worked with private landowners and utilities for years to construct the road, which includes sidewalks, curb, gutter and a center median. 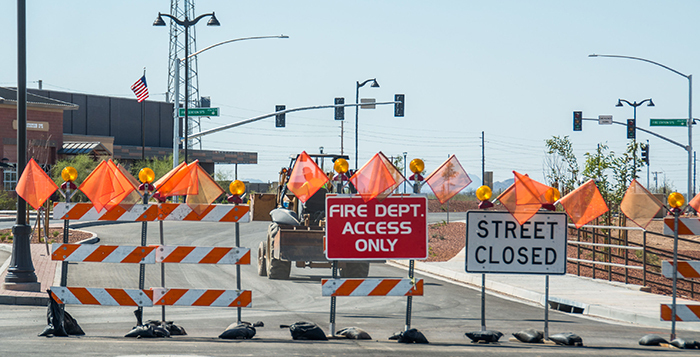 The road was created to access Estrella Gin, and that project has been a problem. The city contracted with The Boyer Company to market the flex space in the business park. That contract expires in June. Matt Jensen, a partner in Boyer, said there has been a lot of interest from small companies needing only 1,200 square feet while the city is trying to market to industrial businesses. A couple of proposals have gone out to larger enterprises. There is also an ongoing discussion with the City of Maricopa about moving the fire department administration offices to Estrella Gin. “That would actually be fantastic,” Jensen said. Without leases in place, the city will not begin construction, but Airheart said the city is looking at “multiple options” if the contract expires without tenants being signed. She maintains a positive attitude about city-owned commercial property. “A community that’s investing in itself means that it’s a healthy community. So we’re showing the development community there are investments to be made,” she said. 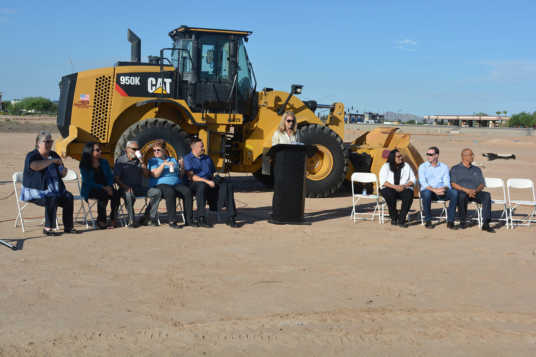 Construction equipment and earth movers began lining up Wednesday in the Edison Pointe lot just south of Fry’s Marketplace on John Wayne Parkway, an encouraging sign after what has been a multi-year struggle to develop the site. Despite what appears to be a commencement of the project, there has been no official ground breaking. Casey Treadwell, leasing director for Vintage Partners, the developer of the project, said there are still a few ducks left to line up before the project officially gets under way. The work beginning this week is an effort to prep for larger scale construction that now seems imminent. Though the activity is certainly preliminary to the larger project, Vintage Partners still has not released a set timeline for construction. Stores looking at space in the new development include a big box pet store, clothing retailers, an automotive service center and restaurants. The Edison Pointe development by Vintage Partners includes four major retail spaces, four mini major spaces and four pads. 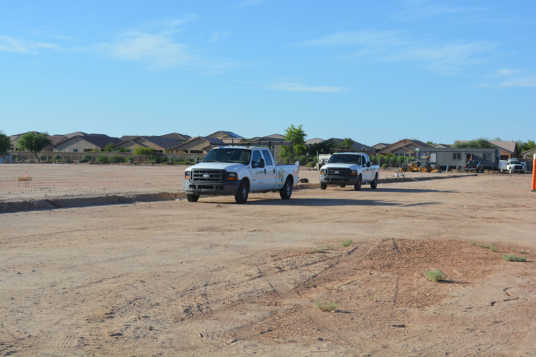 The Maricopa City Council heard a presentation during their work session on Nov. 1 pertaining to a developer’s reimbursement request for public improvement expenses to the Edison Pointe development site. The empty retail lot is next to Fry’s Marketplace. Vintage Partners Leasing Director Casey Treadwell formally requested reimbursement of costs incurred while developing public improvements on John Wayne Pkwy and Edison Road. The improvements are necessary for private development of the 15-acre site but ultimately will be part of public roadway. The developers have been marketing the project for approximately four years and are close to securing the leases needed to move forward. However, some of the potential tenants have been hesitant to sign their leases until the developers shore up an agreement with the city about public improvement. “If this reimbursement is in place, we do think that we can execute the final leases with the tenants over the next few weeks and get this project on schedule to deliver and open in the fall of next year,” Treadwell said. Five major tenants are firm in their intent to lease or purchase property at the Edison Pointe site, Treadwell said. However, two potential major tenants are holding out pending a decision on the reimbursement. If everything goes well and reimbursements are agreed upon, Treadwell is confident the development could break ground before the end of the year, though he does recognize the agreement could make or break plans for development. “Without this it would probably push the project into 2018 if we can do it at all,” Treadwell said. The council went into executive session to discuss details of the request. After returning to the council chambers, Mayor Christian Price and the council advised city staff to pursue negotiations with Vintage Partners and to continue to work out an agreement regarding the reimbursements. Potential tenants at Edison Pointe, according to Treadwell’s presentation, include a pet supply store, restaurants and other “soft goods” (or clothing) stores. If all goes as planned, Edison Pointe will start construction in summer 2016 and be open for business in spring 2017. The lot next to Fry’s Marketplace was purchased four years ago by Vintage Partners. The project is doing business as VP Edison 15, LLC. Michael Treadwell, senior vice president of development leasing at VP, said the plan will allow for 14-15 businesses in 130,000 square feet of retail space. VP is “finalizing tenants,” said Treadwell, who is not identifying those prospects. He said VP is building for the specific requirements of the tenants, however. That location is on the east side of John Wayne Parkway, south of Fry’s and north of Edison Road. Economic Development Director Denyse Airheart said there will be two phases to the project. There are four major retail buildings and four “mini major” spaces designed for the parcel plus two pad sites. The second phase contains two more pad sites. “It looks like 80 percent is in Phase One, and the rest is in the last two pads,” Airheart said. One of the Edison Pointe pads is designed for a sit-down restaurant. Another is for an auto-repair business. She said developers come to the city to learn what businesses would be a good fit and then market their property to those industries. A development review permit has been before the Maricopa Planning & Zoning Commission, which recommended it for approval. The project is one of the first major developments to operate within the city’s new zoning code, which became effective Dec. 5, 2014. Airheart said that will give the project a different look and layout from Maricopa’s older commercial developments because of modern elements in the facade. At the same time, it is meant to fit visually with Fry’s Marketplace. Its planned color scheme for the major buildings is whites, creams and tans. There are also plans for raised pedestrian crosswalks in the parking area. Treadwell said the plans are coming together exactly as VP envisioned when it bought the property. Access from John Wayne Parkway has been a point of concern as the project moves through development. Southbound drivers on JWP wishing to access Edison Pointe must either turn left at the Fry’s light and drive through the Fry’s parking lot or turn left at Edison Road. City planner Rudy Lopez said there would be up to three access points off Edison. Edison Road is two lanes. Resident Lee Murray said traffic on Edison trying to get onto SR 347 already backs up at rush hour. Airheart said there have been no recent discussions about adding lanes to Edison. Lopez said traffic review is part of the development conditions. The zoning code’s Transportation Corridor overlay district applies to the first 150 feet of parcels fronting State Route 347 and other major throughways. The TC overlay is meant to “prevent developments which would conflict with the vision in the General Plan for these corridors or interrupt the transit, bicycle and pedestrian experience,” according to Article 301 of the zoning code. Treadwell said VP has a long-standing, strong relationship with the Arizona Department of Transportation (ADOT), which has authority over John Wayne Parkway. Most recently in Maricopa, VP worked with ADOT to add northbound exits for its Maricopa Station project. “We work very well with ADOT, and we’ll certainly be discussing this with the city,” Treadwell said. He said VP intends to announce each tenant as paperwork is finalized. 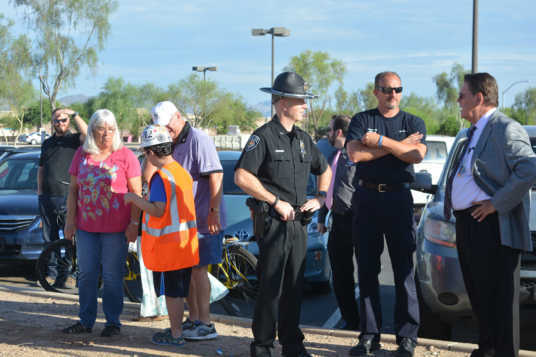 This story appeared in the January issue of InMaricopa News. 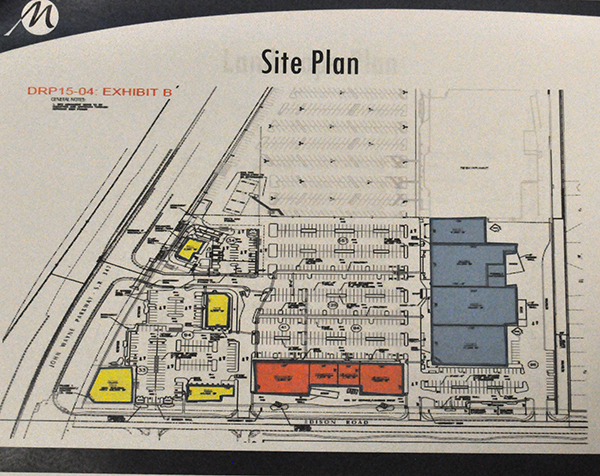 Elevation of planned stores at the Edison Pointe development. 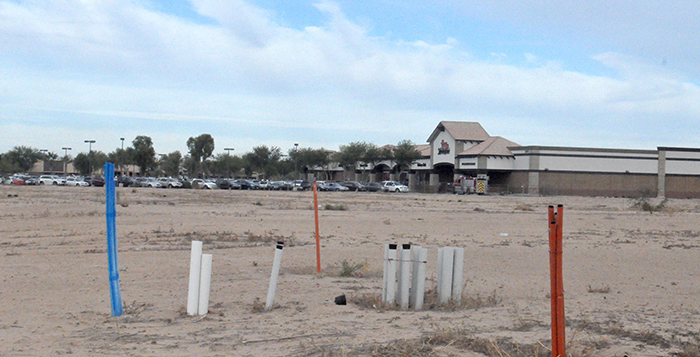 Though worried about the traffic flow, Maricopa Planning & Zoning commissioners approved a development review permit for the proposed Edison Pointe south of Fry’s Marketplace. The commercial development is designed for stores and shops, an auto-repair business, a sit-down restaurant and a fast-food restaurant. The property is on the northeast corner of the intersection of John Wayne Parkway and Edison Road. As VP Edison 15 LLC, Vintage Partners is developing the property. The plan calls for 130,000 square feet of retail space. City planner Rudy Lopez said there would be one access off John Wayne Parkway, possibly three access points plus the delivery road off Edison, and entry from the Fry’s lot. “I believe they captured the spirit of the zoning code we carefully wrote,” Commissioner Bob Marsh said. Lopez said the city wants to “de-emphasize” parking so there is not the appearance of a sea of cars. An alternative design element includes a raised walkway. “This is something that we need for economic development,” Commissioner Michael Sharpe said, adding he felt it was forward thinking to include possible electric car charging stations. But Sharpe also raised the issue of traffic access by vehicles southbound on John Wayne Parkway. He said he could foresee the same issues the city has with Maricopa Station but on a property two or three times larger. He asked Lopez whether a U-turn would be created. Lee and Barbara Murray, who live in The Villages at Rancho El Dorado, also told the commission they were concerned about the traffic. Lee Murray said the traffic on Edison already backs up. Commissioner Jim Irving, also a Villages resident, said the idea of a U-turn at the intersection “really scares me” because he frequently cycles on Edison and his wife walks. He wanted to emphasize traffic review as the plans move forward. “How in the world are people going to get in and out of this place?” he asked. Lopez said traffic review is built into the conditions of the property development. He also said any traffic configurations affecting John Wayne Parkway, a state highway, must be reviewed by the Arizona Department of Transportation. VP must present the plans to ADOT for review. Maricopa City Council must also review and approve plans.